In spite of the many opportunities and risks in the oil and gas sector, Uganda has the opportunity to become a low middle income country in 15 years if the oil reserves are well distributed. By joining the middle low level, Uganda will be riding on the footsteps of countries like Botswana. Stuart Kerr, the Director Legal and Regulatory Millennium Challenge Corporation (MCC), a US Government foreign aid agency, says while many countries that discover oil do not develop, there was no need for Uganda to follow the footsteps of countries where revenues are stolen. “The world is looking at Uganda with a strong hope that the oil revenues will power Uganda into the future,” says Kerr. Kerr, a former Executive Director of the International Law Institute (ILI), a 55 year old NGO with branches in several countries, was on August 26 speaking at a cocktail party organised for him by ILI. “It is very easy to administer things poorly; it’s very hard to administer them well. Think about Nigeria where most of the oil revenues were stolen. This is a real critical moment and wonderful opportunity for the country and people of Uganda,” Kerr said. Kerr argues that for Uganda to develop, legal structures have to clearly put in place. “Mature legal structures will be more important for development. Physical infrastructure is very important, but without legal infrastructure it is a disadvantage,” Kerr further said. Speaking at the ceremony, the ILI Sub-Regional Executive Director, Mr Swithin Munyantwali, said since its establishment in 1997, ILI-African Centre for Legal Excellence (ACLE) has become the primary provider of legal infrastructure development. “There tends to be an imbalanced focus on the development of physical infrastructure at the expense of legal infrastructure. But without a solid functioning legal infrastructure, you will not have meaningful economic development,” Munyantwali said. Munyantwali in close to one and a half decade of its existence, ILI has expanded its reach and implemented law reform projects in over 35 countries in Africa partnering with key bilateral and multilateral donors ILI serves countries through training, research, publishing and technical assistance. MCC provides grants of several hundred million dollars per country to a small number of developing countries that perform better than their peers in governance, investing in people and economic freedom. Created by the US Congress in 2004 with strong bipartisan support, MCC is an innovative and independent agency helping lead the fight against global poverty. It is also changing the conversation on how best to deliver smart US foreign aid by focusing on good policies, country ownership and results. His main challenger in the February 18 parliamentary elections could have withdrawn the election petition challenging his declaration as Bukoto Central MP, but Vice President Edward Kiwanuka Ssekandi may soon find himself in the dock over the same matter.Four former witnesses in Jude Mbabaali’s election petition have petitioned the High Court in Masaka, calling for the reinstatement of the election petition for a final determination on grounds that it was unlawfully disposed of. In a miscellaneous application, No. 108 of 2011, filed at the High Court in Masaka, October 20, the applicants, in their affidavits, contend that the procedure through which the order for leave of court to withdraw the petition was granted was illegal and contrary to the laws governing the withdrawal of election petitions. The four applicants, all voters of Bukoto Central constituency, are: Margaret Nansubuga of Mmanzi village in Kyannamukaaka sub-county, Charles Samula of Kabonera A in Kabonera sub-county, Robert Kasiita of Bisanje West in Kabonera, and Barbara Kabejja of Kabonera trading centre, also in Kabonera sub-county. Two of the applicants claim to have been present in court the day Mbabaali withdrew the petition, which had come up for hearing before Lady Justice Elizabeth Musoke. Mbabaali withdrew his petition on July 27, the same day Ssekandi threw a thanksgiving party to celebrate his appointment to the vice presidency. “Hearing of the petition started by counsel for the petitioner (Chrysostom Katumba) making an oral application for leave to withdraw the petition and after hearing submissions by all counsels on the said oral application, Hon Lady Justice Elizabeth Musoke immediately granted the order for leave to withdraw the petition,” Margaret Nansubuga said in an affidavit supporting the application. According to their counsel Rowland Mugisha of Tebusweke, Mayinja, Okello and Company Advocates, the petition was withdrawn in a manner that contravenes the procedures laid down in the Parliamentary Elections Act 17/2005 and the rules pertaining to the withdrawal of an election petition. “There was no formal application for leave to withdraw the said election petition and accompanying affidavit, as required by law,” Mugisha contends in his accompanying affidavit. He further states that the legal requirement to post the application on the court’s notice board was omitted, as was another provision that requires the publication of the application in the Gazette. “The Attorney General was never involved in the process of the withdrawal, as he was never served with a copy of the application for leave to withdraw the petition as required by law,” Mugisha further states. The other legal requirement that was allegedly flouted was that the application was heard before a judge instead of a registrar, yet no report was made to the Electoral Commission stating the reasons for the withdrawal. Mugisha further says his perusal of court records indicates that there is no evidence that Justice Musoke met any of the legal requirements for the withdrawal of election petitions before granting the order to withdraw. The applicants, therefore, want Justice Musoke’s order to be set aside and the petition be heard on its merits, since the procedural illegalities are likely to set a bad precedent that may have far-reaching effects on jurisprudence and development of democracy in the country. They also contend that as voters in the constituency and as witnesses in the petition, they were never consulted before the petitioner withdrew the petition. The applicants also pray to court to substitute them in the place of the petitioner in case the petitioner (Jude Mbabaali) is not willing to prosecute the petition to its logical conclusion. The EC controversially declared NRM’s Ssekandi winner of Bukoto Central parliamentary elections after polling 11,380 votes (49.5%), against DP’s Mbabaali, with 10,146 votes (44.2%). The other contender in the race was an independent candidate, Abdu Nasser Mwanje Ssenabulya, who garnered 1,424 votes (6.2%). It took months of formalities before a couple settled in as husband and wife. It was the parents’ duty to find partners for their children. Marriage was based on research and love came later. One form …of betrothal was Kuswera mu matundu or antenatal betrothal, where a father booked an unborn child for his son. Or, a man would tell a close friend, ‘my wife is pregnant, I give her child to you.’ If the child were a girl, this friend would have her as a wife for his son. This young girl, who had been booked, attained the status of ‘wife’ at an early age. At five or six she was handed over to the family that had booked her where she grew up as a daughter and got groomed by her mother-in-law to be. During this time, the boy meant to marry her had no knowledge that this was his future wife, and took her like a sister. Insisting that couples have a right to be united in marriage when they were old enough the colonialists later stopped this booking and it became a crime. Those not booked earlier would start preparing for marriage at puberty. Girls would start applying special ghee on their skin, trimming their nails and shaving their hair. A boy’s family looked for a girl whose personal and family background was good and avoided families with chronic or hereditary diseases. When a good girl was spotted, a go-between, kiranga obuko, was dispatched. The prospective bridegroom, accompanied by a few kinsmen, would pay a formal visit to the girl’s home, bringing a gift of a large goat and pots of banana beer. On this visit, the boy’s father vaguely announced his intentions, and thereafter promised to pay another visit. On the next visit, he made his point. “If there were many girls, they would be brought in and the boy would point out the one he wanted. The girl’s family would try to learn more about the other family’s reputation. When the proposal was accepted, they knelt down and thanked their hosts. Throughout, the bride’s group assumed an air of haughty superiority, while the groom’s family was humble. Next, they would take beer over which to discuss the bride price, amaarwa g’ekicwa muhendo. When this beer was delivered, the negotiation started. Bride wealth included cows, goats and many pots of beer. Usually, families married from families of equal social standing. After the payment of the bride wealth, a small strap from the hide of a small animal, engonge, was tied on the arms of the couple as a symbol of engagement, like engagement rings. The bridegroom’s family brought beer (Amaarwa g’ekigambo or ‘alcohol for the word’) to the girl’s family and they were told the date when to take the girl. When the girl’s family was ready to give away their daughter, they sent for amaarwa g’ekimwa isoke, or ‘beer for shaving the hair.’ The groom’s family would deliver this beer. The bride had to be shaven as it was taboo for both the bride and the groom to appear on their wedding day with hair. Effort and time was put into preparing the bride for her wedding. She did not do any chores. Among the cattle keeping communities, she was fed on milk to make her fat, as fat was, and still is, attractive. She was smeared with cow ghee and her body perfumed with special incense. Her body was scrubbed with a type of red soil, which left her skin smooth. The girl received presents, ensagalizi, from parents and relatives, including straw mats, cow hide carpets, baskets and bark cloth. The bride took with her a bag full of incense made out of dried and smoked papyrus reeds and scented herbs. The bride would take these herbs, known as emigajo to their bedroom, which made the house smell good and also aroused her husband. An Introduction CeremonyThe bride was taken at night. The in-laws arrived at her home in the evening. Shortly after their arrival, the bride was taken into a nearby bush and given marriage tips by her paternal aunties, abaisenkati and they sang a special send-off song, ijooje. The bride sat four times on her father’s laps and her mother’s laps, which was okubukara, a way of officially bidding her farewell and blessing her marriage. The in-laws would then sing, engoma nyabahuma, begging to leave. At this point all the women would be crying for their parting member. When the bride was about to leave the house, one of her cousins would lie across the doorway to prevent her from leaving until the bridegroom’s party gave him 10 cowrie shells. This cousin would carry her on his back and whenever the party stopped to rest, the bride would sit on the laps of her aunt. When the bride entered, the groom would sit on his father’s laps four times and four on his mother’s laps. The bride would do likewise, which was okubukara, a sign of welcome and acceptance of the girl. This was okuteera omusango, when the groom and his parents received warning from the visitors shortly before their departure, to treat their daughter well. It was done by an old man on behalf of the bride’s father. He would say: ‘This child of mine has come with two names; when she receives a third one, let me know. My child does not visit unnecessarily. She does not visit and spread rumours bringing enmity between homes. She does not stare at passers-by, she does not abuse people, and she does not steal. If she abuses her father-in-law beat her. If you can’t cope with her, send her back to me. The bride would also be told to behave well. Then the visitors would depart, leaving her aunt who would stay for a few more days. If the bride had been found virgin, the mat with the patch of blood was taken back to her mother, with a gift of a goat. If the bride had no virginity, the groom burnt holes in the mat and instead of a goat, sent her a sheep. The mother would weep in shame. In the last ceremony, the bride would leave her enclosure. She would uncover her head and start doing housework. Pro-Ankole Kingdom (Obugabe) activists have hit back at those opposed to the cultural institution, including President Museveni, saying there’s no need for them to seek the restoration of the kingdom by government because a law enacted in 1993 restored all kingdoms abolished in 1967. William Katatumba, the kingdom’s Prime Minister, says in a document seen by The Observer that according to the law, Traditional Rulers (Restitution of Assets and Properties) Statute 1993, John Barigye Ntare VI is the King of Ankole who only awaits the return of his kingdom’s regalia and properties. “By virtue of both the 1993 Statute and the 1995 Constitution, Obugabe of Ankole was restored and John Barigye Ntare VI is the King of Ankole. What remains is for the Uganda Government to recognise that fact, return to the Omugabe (king) his royal drums and all the other regalia, as well as [his palace] at Kamukuzi, Mbarara, and other kingdom property,” Katatumba says. His declaration of Barigye as king is likely to jolt some in the NRM government, especially non-Bahima, who are vehemently opposed to the restoration of the monarchy. He demanded a public apology. “It is unfortunate that some people who were in the forefront of fighting to bring unity and peace in Uganda are now the same people who are sowing seeds of disunity and threatening to stone people if they do not follow their wishes,” he said. Katatumba added that President Museveni, who visited Bushenyi District last week to address the Obugabe issue, underestimates the popularity the cultural institution enjoys in Ankole. “The President has been misinformed by his political leaders that the District Councils of Ankole do not support the recognition of the Obugabe. The fact of the matter is that an overwhelming number of councillors in all district councils of Ankole support the Obugabe.” He claimed that in one district, which he declined to name, the Obugabe has 100% support, and in another more than 95%. 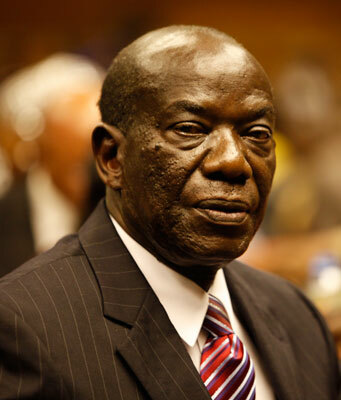 Katatumba also accused the President of “shifting goal posts” on the issue. He was referring to the President’s comments in Bunyoro late last year, in which he said that the restoration of the Kingdom of Ankole must be endorsed by district councils in the sub-region. “Now that our support of the district councils is certain, goal posts have been changed and the new requirement is to get the support of LC-III [councils] as well,” Katatumba said. The President recently claimed that those campaigning for the restoration of the kingdom were bribing councilors to pass a resolution to that effect, an accusation Katatumba denies. “Ankole Kingdom, once recognised by government, will be fighting against the rampant corruption and bribery that has bedevilled all sectors of our society. It is, therefore, hard for any one to believe that it is now the institution that is promoting it,” he said. He adds that allegations of bribery were crafted by people opposed to the Obugabe after realising the overwhelming support that the institution received in district councils. Mbarara, Isingiro, Kiruhura, Ntungamo and Bushenyi district councils recently inconclusively debated the issue amid claims that they had been bribed. Fingers were also pointed to a foreign country as having had a hand in the move. The issue of Obugabe resurrected in November 2009 when a meeting of cultural leaders in Masindi called for its restoration. Later, the Omukama (king) of Bunyoro, Solomon Iguru Gafabusa, who chairs the Uganda Cultural Leader’s Forum, wrote to all district councils in Ankole, imploring them to pass resolutions for the restoration of the monarchy. This was in line with President Museveni’s counsel during the forum that demands for Obugabe restoration should be endorsed by district council resolutions. He rejected claims that Obugabe is divisive. He adds that misdeeds committed by kings in the past can’t be repeated in modern Uganda. Where many a young Filipino would turn to nursing as his or her ticket to the good life, a bank executive became a nurse so she could go as a volunteer to one of the poorest and, until quite recently, most violence-wracked nations on earth. Annette Aguila, 38, left the safety of the executive suite to immerse herself in the swampy West African nation of Sierra Leone where an international campaign is under way to eradicate malaria, the killer disease. Trading her business suit for scrubs, Aguila is on a 10-month tour of duty in the Sierra Leone capital of Freetown as one of four international volunteers handpicked by the Tony Blair Faith Foundation (TBFF) to carry out its “Faiths Act on Health” program. “Through this endeavor, I can make a significant contribution to Sierra Leone, where life expectancy is only 47 years old. This low figure is significantly linked to malaria despite the fact that the disease can be prevented and is curable,” said Aguila in an e-mail message. Aguila, a native of San Jose, Occidental Mindoro, was among only four volunteers chosen from 45 applicants from around the world. The three other volunteers serving with her have notable experience in development work: Josephine Muhairwe, a doctor who has worked in Uganda and the United States; Canadian engineer Aatif Baskanderi, and Londoner Banke Adetayo, whose master’s thesis traced the history of global malaria eradication efforts. Started in 2008 by the former British Prime Minister’s foundation, Faiths Act aims to “create a multifaith educational solution that will help eliminate deaths from malaria” through health education and training of local health workers, the distribution of treated mosquito nets and a grassroots information campaign. The program also hopes to bridge the different faith communities in Sierra Leone, a diamond-rich nation of various ethnicities that has yet to recover from a decadelong civil war that ended in 2002. As the political situation remains volatile, Sierra Leone still struggles to rebuild its institutions, especially its health service system. The country is known to have one of the highest infant mortality rates in the world, according to the TBFF, owing to the dearth of medical workers: there are only 102 medics for a population of around 6 million, or one doctor for every 56,000 people. “If this model works in Sierra Leone, it can be replicated in other countries. I hope that eventually, people will see religious communities as a force for good rather than as a cause of division and conflicts,” said Aguila. Aguila arrived in Freetown earlier this month, her second time in the country as a volunteer in a period of just two years. She had spent time there in 2009 as a volunteer nurse for the British charity Voluntary Service Overseas (VSO). “What drew me to the fellowship was my desire to be part of the team leading the campaign against malaria in Sierra Leone, which I consider my second home,” she said. “This gives me a chance to go back to Makena where I spent 15 months as a VSO volunteer. It thrills me that I am seeing again my former manager, my students, my friends, and most especially the kids in the neighborhood,” she said. In the next 10 months, Aguila will be involved in training local volunteers and touching base with local health authorities to make sure the malaria prevention program is sustained. Aguila obtained her nursing license three years ago, having quit corporate life two years earlier. “I spent almost a decade in the corporate world, at first pursuing a career with all the energy and enthusiasm of a young professional trying to climb the corporate ladder,” she said. “But in my last two years with the bank, I was no longer happy and felt weighed down by the continuous stress at work and monotony of the routine. The main reason I lasted that long was that I liked the people I was working with, many of whom are now my closest friends,” she said. She also needed a “welcome distraction” from a personal crisis, having just ended a 10-year relationship. She decided to take a second degree, enrolling in a nursing course at the University of Makati. According to Aguila, a political science graduate of the University of the Philippines, she may have been unconsciously drawn to the health services field because of her mother’s being a dentist. From childhood, she had been in the habit of assisting at the dental clinic in her free time. The combination of health service and volunteering was apparently also in her blood: her family raised her in an atmosphere of giving, from church work to helping strangers in need. “In third grade, a few days before Christmas a very young Mangyan couple with a newborn in the mother’s arms showed up at our doorstep asking for food. Without a second thought, my parents welcomed them into the house,” she said. “They stayed with us for several days until after Christmas. Oman and his wife Kili are constant visitors at our house not only during the Christmas season but any time of the year,” she said. She has brought with her to the country she considers her second home qualities that she believes are very Filipino: resilience, hard work and cheerfulness. “These qualities are important especially when working in a challenging environment. It pleases me to know that our skills and experience are as valuable as those of our foreign counterparts’,” said Aguila. “The life of a volunteer can be very challenging but it can also be a very fulfilling experience. You may be surprised to discover that by changing the lives of others, you can actually be saving your own,” she said. I am glad to share with you our solidirTEA event that took place last evening in Kauga Village Mukono Township. It was a very joyful moment, well attended by all the people I invited. Hosting this event was so beautiful seeing people of different faiths; Muslims, Catholics, Seventh Say Adventists, Anglicans coming together to honour the 10th – 20thDecember SolidariTEA campaign and issues regarding the Millennium Development Goals particularly putting an end to extreme poverty with in their communities. with a cup of tea keeping us warm whole evening. It’s unusual for people of different faith to join for such an event and to share knowledge, experience and eat freely. I thank the almighty that our Muslim friends were able to be with us and eat with us without any scepticism. The event started late a 6:00pm East African time, we opened with a prayer that was given to us by Hajji Rajab Ibrahim a friend and an Elder in “Masigid Nour Mosque in Mukono” ,then everyone introduced themselves. The majority were young university students, we then introduced the Topic of the evening “DONT YOU THINK THE WORLD NEEDS ALITTLE MORE SOLIDALITEA? I asked everyone to look at his or her Flier, and tell they team what they thought, if they would join people in the rest of the world in this campaign of bringing the world together and how they could use their faith to help fight poverty, conflict, disrespect and much more. Everyone was willing to say a word and express their views , with cup of tea in every ones hand people shared ….wow it was so beautiful when it came to this. If Indian life was to be embodied, faith would be its blood. It doesn’t matter what religion an Indian practises, everyone is guided by faith, often unknowingly. While some faith communities formally pass their teachings to the next generation, most people in India would imbibe faith via day to day traditions, popular media and often stories told by grandparents. Every shopkeeper in the country prays before starting business each day and every school starts with prayers. There is no exception to this rule. With that said, it is quite bizarre that most of these people are hesitant to call themselves ‘people of faith’. The faith identity of each person in India is so enmeshed with the person as a whole that most people (including us before this fellowship!) would not even recognize the presence of faith. Would you ask a human being “are you made up of bones?” and does everybody recall each day that they are made of bones? We all in India engage in charity by the way of traditions, unconsciously donating to places of worship, holding community kitchens and doing poojas (offering prayers to the gods). All of these are inextricably linked with faith but done mostly because of each family’s traditions and at times, social compulsions. Faith in India is on an auto-pilot mode, one does not shift the gears, one just runs along with it. These days, the Hindus are celebrating navratri (nine pure nights in sanskrit). During these nine nights, nine forms of the Hindu Goddess are worshiped. Every Hindu community – on the basis of which part of India they belong to – celebrates it in a completely different manner. One could mistake them for different religions! The festive season has kicked off as people all over the country are engrossed in colorful traditions, prayers, music, dance and drama. This is India of the 21st century, continuing traditions 5,000 years old unknowingly and unintentionally. Yesterday, we went to watch Ramlila (the enacted story of God Ram’s life) at a neighbourhood park. We were stunned, because this park just fifteen days ago was a swamp, a marsh land full of puddles and mosquitoes, and grass as tall as three feet. However, the Ramlila organising committee has got this park cleaned, planted new saplings and carpeted the ground for the nine day long show. We were also pleasantly surprised when shop boys from the nearby market greeted us at the security. Our local tailor told us happily that this is a great volunteering option for them as they earn a stipend and dinner by working for the Ramlila after their shops close. Later, he cheekily added “aur punya bhi kama rhe hain” [and I am also earning good deeds]. This made us think that this Ramlila committee had worked on two Millenium Development Goals (MDGs) – environmental sustainability and ending poverty and hunger. Faith here was working as a force for good. And yet, like everything connected with faith in India, this was done unknowingly and unconsciously! before though they were interested. Aatif – A mosque is one venue that, no matter where I am in the world, I am extremely comfortable. However, this visit was different due to the fact that I was now accompanying my faithful friends to share in the experience who, like many others, happen to be Christians that have never visited a mosque. Prior to the excursion, we had the opportunity to have discussions about how some people feel hesitant to enter a mosque as opposed to a church. Many see mosques as a black box (pardon the pun) that lacks transparency and hence limits the comfort of a stranger to enter, an issue that mosques in Canada always had to engage with. Muslims constantly advertise that if you want to learn about Islam, just walk into your local mosque, yet people remain hesitant. My only desire for this trip was to demystify the mosque for my friends, just as living with each other has been an interfaith incubator that has demystified so much more about our faiths. I hoped to share my feeling of how many mosques around the world are accepting to strangers who sincerely seek knowledge, and as Faiths Act obliges so, via direct action. There were other major aspects about this mosque trip that should have excited my mind the most, such as hearing Teslim’s amazing khutbah (sermon) about the faithful duty to tackle malaria in your life or myself addressing the congregation post-prayer by explaining what the Tony Blair Faith Foundation’s Faiths Act Programme is, yet my primary concern was how the other fellows were taking in the experience. This was also exacerbated by the fact that they are women and, as is the case with many religions, Islam does have particular gendered aspects, especially inside the mosque, which “outsiders” may engage with differently. I will allow the other fellows to explain a bit about their experiences, a commentary I keenly sought throughout the day. Annette – The idea of visiting a mosque was far-fetched for me when I was in the Philippines. I always wondered what was inside the mosque out of curiosity but I never imagined that would actually visit the revered place. In my home country, Christians are not welcome to go to the mosques, or at least that was my general impression. The night before the visit, I was both excited and worried. It was a good thing that Aatif, another Faith Acts Fellow, provided helpful tips on how to prepare ourselves, how to dress properly and who would accompany us during the prayer. As I was getting ready with my head scarf, long sleeved blouse and long pants, I started preparing my thoughts and my feelings as well. The first thing I noticed when we entered the mosque was that men and women stayed in separate rooms with the men in front and women at the back. I found the arrangement a bit strange but Aatif explained that one of the reasons for segregation was to ensure that there will be lesser distractions during the prayer. I also noticed that everyone was dressed beautifully; Teslim earlier explained that when attending prayers, each one dresses up as if he or she is going to meet an important person like the president of the country, only he or she is going to meet the most highest and supreme being that is Allah. What struck me most was the warm and welcoming atmosphere I felt when we were inside. Aatif was almost certain that people knew we are not Muslims. But people smiled and talked to us. They told us to line up when the prayer started and shook our hands when it ended. Children came to us to ask if we could be their friends. That made the experience very touching. I was expecting to see a totally different people, strange practises and hostile environment but instead I found myself being embraced warmly by the community. I never felt alienated. In fact I am convinced that while we were inside the mosque I felt a connection with a Higher Being – the same serene feeling I have when I am in my own church. Banke – My only experience of being in a mosque had been a school trip to a mosque in North London, however I still was not sure of what to expect, aside from feeling that I would overcome preconceptions I had about Muslims and worship in the mosque. Upon entering the female section of the mosque, the first thing I noticed was the bright array of colours worn by females. The second was that the people were very friendly and welcoming. Though I was more curious than apprehensive about the session, I felt more comfortable by the time the prayers started. I was surprised to find similarities with the worship in a church. For example, at a point in the service, we were told to greet each other with the sign of peace, an action which is commonplace in a church service. I was happy to observe that during the sermon, Teslim had the full attention of the worshippers, as he talked about malaria prevention. Overall, visiting a mosque was a positive experience, with a pinch of humour as Annette and I unknowingly joined in with the prayers, but were luckily shown the movements by a friendly neighbour. Josephine – I had always wanted to visit the mosque but like many Christians women, I thought it was not possible. So I was really surprised when Teslim agreed to invite us to his local mosque for Friday prayers! All we had to do was dress appropriately in clothes that cover arms and legs, cover the hair and follow the women to their section. While it was so obvious that we were visitors, the women were very friendly, welcomed us and were willing to guide us. During the sermon, I spent a few minutes reflecting on my own misconceptions about worship in the mosque that had been fuelled by hearsay. It was fascinating to hear Teslim incorporate the malaria prevention message in his sermon. Although I could not understand the prayers, I felt very comfortable following along because we were praying to the same God. Reflecting on this experience, I am grateful for Aatif’s encouragement. MPs draft motion as State House denies reports that the President has already suspended Premier. A group of lawmakers have drafted a new motion seeking the suspension of ministers accused of allegedly accepting million-dollar bribes from oil companies from Parliament for contempt. With the House leadership appearing to be shying away from enforcing one of its resolution compelling the ministers to step aside pending investigation, about 10 lawmakers now want to invoke the Parliamentary Rules of Procedure to have Prime Minister Amama Mbabazi and Internal Affairs Minister Hilary Onek suspended. Mr Mbabazi, who is also leader of government business in Parliament, along with Mr Onek is this time accused of failing to adhere to parliamentary resolutions. Foreign Affairs Minister Sam Kutesa, who was named in the same matter at the outset, is not included this time having stepped aside from the ministry over his ongoing prosecution for an unrelated allegation of corruption arising from a 2007 Chogm transaction. Yesterday, Speaker Rebecca Kadaga met the MPs who put her on notice of their impending motion to be moved by Mr Gerald Karuhanga (Youth Western), the same MP who blew the whistle on the alleged bribery during the special Parliament meeting on oil two weeks ago. “Now therefore; be it resolved by parliament as follows: Hon Mbabazi and Hon Onek be found liable for contempt of Parliament and suspended from the House until such time when the ad hoc committee reports to the House on the outcome of the investigations,” the motion, which is yet to be given to the Speaker, reads in part. Three days ago, Ms Kadaga informed MPs that she has communicated the resolutions to President Museveni. But this revelation seems to have only inflamed those who believe that the Executive is interfering with the independence of Parliament. The matter also remains unresolved on the back of the NRM parliamentary caucus’s recent agreement that the ad hoc committee should investigate the bribery allegations without the ministers stepping aside. Yesterday, Mr Mbabazi’ status remained confused with sources, who attended the morning meeting with Ms Kadaga, saying information was shared suggesting that President Museveni has reportedly indicated that 3rd Deputy Premier Gen. Moses Ali, will be the acting leader of government business. Daily Monitor could not independently verify this claim with the Speaker. Mr Mbabazi was not in the House yesterday leaving Gen. Ali to act in his position, though other sources said he was busy chairing the weekly Cabinet meeting. At the meeting, Ms Kadaga is reported to have asked the MPs to stay their motion until the ad hoc committee which is due to be constituted today is put in place. But Mr Ssekikubo reportedly told her that the principle of separation of powers and arms of government must on all occasions be adhered to. Mr Karuhanga told this newspaper that “there is no problem” with the Speaker’s request for a stay of execution. “In the course of the week we do hope our motion finds space on the order paper otherwise, we shall not be deterred,” he said. State House has, however, denied that Mr Mbabazi has been set aside. “The President has said their documents were forged. Those MPs should know that you cannot dig a grave on a Fool’s Day advert. As far as my bosses are concerned Mbabazi is still the prime minister and the leader of government business. There is no letter to Kadaga appointing Gen. Moses Ali,” said Presidential Spokesperson Tamale Mirundi. Meanwhile, Energy Minister Irene Muloni yesterday tabled 10 Production Sharing Agreements the government signed with foreign oil companies. Ok, what is your first impression? It was a brutal, gratuitous slaying of an almost 70-year-old man, killed after being captured. And if the intent of 216 days of NATO bombing was to kill him in the first place, which is clearly the case, with the multiple bombings of his compound in Tripoli, which in one case killed one of his sons and three grandchildren, it is clearly targeted killing and I suppose NATO can now claim success. It has got what it wanted. President Barack Obama said that there is going to be a pull-out from Libya very soon, so in your mind does that mean the objective has been met? Yes, it has entirely. Regime change, take-over of Africa’s largest oil reserves, the incorporation of Libya, which hitherto had been the only North African country that was not a member of NATO’s so-called Mediterranean Dialogue, into what is now according to Secretary General Anders Fogh Rasmussen a military partnership with the North Atlantic Alliance…So in every sense their objective has been accomplished. It’s certainly nothing that is going to benefit the Libyan people. You don’t see this as being justice for the oppressed Libyan people? I mean there are people saying that Gaddafi was a terrible guy. He killed thousands so he deserved to die. There is just so much – what term do I want to use? – low taste, gratuitous reveling in the murder of this man, who was born 70 years ago in the very city he was murdered in on the 216th day of NATO’s bombing of his country. He was born under Italian Fascist occupation and he died under NATO occupation. I think the parallel there can’t be missed, including the fact that Italy supplied some of the warplanes that have devastated his country since the middle of March, since March 19th. If he was the monster they’ve portrayed him as being – and I invite your listeners to go to the NATO website and see some of the crude caricatures of Gaddafi they’ve posted over the last few days – wall graffiti and so forth – portraying him in a demeaning and belittling way, to further dehumanize him preparatory to murdering him. Alright, I saw some television coverage of his naked body being thrown around like a piece of meat. I am sorry for the expression. Yes, after they brought him to Misrata. This is sickening, barbaric and worse than barbaric treatment and it’s in a long line of similar travesties. This is true with Slobodan Milosevic in Yugoslavia and Saddam Hussein in Iraq, with any leader of a country that doesn’t kow-tow entirely. I am not putting all these people in the same basket. Let’s rephrase that. Any leader whose time has come according to the United States and NATO can expect death. Hussein was hanged, Gaddafi was shot. Whereas Gaddafi was considered to be – he was only nominally so, but he was considered to be – the head of state and even the head of the military, and the bombing of his private residences under the guise of their being command and control centers suggests that he was considered by the North Atlantic Treaty Organization to be in charge of the Libyan military, when he was captured on Thursday his treatment was governed by the Geneva Conventions, but instead he was shot through the head and murdered. 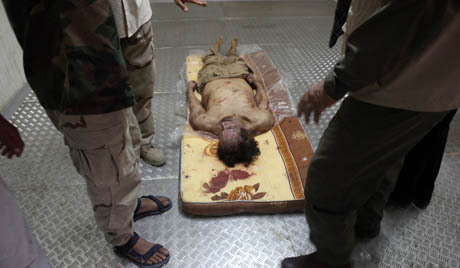 This is the new regime that is being implanted in Libya, and for all the West’s talk of the rule of law and humanitarian concerns and so forth this is a graphic image of its true intentions, just like the death of Slobodan Milosevic in a veritable dungeon in the Netherlands because he was denied proper medical treatment in Russia, and the grotesque hanging of Saddam Hussein. This is the image of the new world order, a world order in all its transparent barbarism. What do you mean he was denied medical treatment in Russia? Russia offered to make a deal with the International Criminal Tribunal for the former Yugoslavia to bring Slobodan Milosevic to Moscow for medical treatment, but he was denied that opportunity and he died shortly thereafter. Even more foul play may have been involved but the message is very clear. Do you see a pattern, I am sorry to interrupt you there. Do you see a pattern here, I am sure you do, between Hussein, Osama Bin Laden and now Gaddafi? I mean, we have countries, for example, Hussein and Gaddafi, they pretty much stopped their weapons’ programs. They cooperated with the CIA, in this case from what I’ve heard, and it’s pretty much a given, Gaddafi was assisting the war on terror fight by the United States by allowing rendition flights to Libya. He stopped his weapons programs. Do you see a pattern here? Yes, there’s a very clear pattern. That the United States and the North Atlantic allance use somebody for whatever purpose they want to and then get rid of them and kill them afterwards. Slobodan Milosevic, at political risk to himself inside at that time the Federal Republic of Yugoslavia, played a role in negotiating an end to the armed hostilities in Bosnia, in gratitude for which his country was bombed for 78 days in 1999 by the United States and its NATO allies and subsequently he was left to die in prison. He had a deal with the CIA, I think, it came out, and I think that it’s pretty much a part of the public record that he believed that he was going to be protected. I don’t know the details about that but at the end of the day what we see is there are a lot of corpses and we see the killings of heads of state. We have to recall that again, even though he was a titular, a nominal, head of state, Muammar Gaddafi was the longest reigning leader in the world. He is was last personal link – since Fidel Castro retired as president of Cuba – between the post-World War II national liberation struggles and the emergence of new nations during the Cold War era and the post-Cold War era that issued in NATO as an international military strike force that can topple governments at will around the world. NATO boasts on its website as of today of flying over 26,000 air missions over a country of six million people, with well over 9,000 of those being combat sorties. So this monster has been unleashed over the last 20 years and Libya will not be the last country so targeted. That you can be assured of. I don’t know if Libya is able to be put back together again. The Western powers incited regional and tribal differences in order to topple the former Gaddafi government, and believing you can put that genie back in the bottle is overly optimistic – and disingenuous. With the military commander of the National Transitional Council [Abdel Hakim Belhaj] being somebody the United States incarcerated and interrogated as part of its “extraordinary rendition” program and a former fighter in Afghanistan, past leader of the so-called Libyan Islamic Fighting Group, you have al-Qaeda elements and tribal separatists – they’ve created real pandemonium here and now they claim that they want to stabilize Libya. I don’t see it happening. At the end of the day, with the alleged no-fly zone and humanitarian intervention, NATO has transparently waged a war against a government on behalf of insurgents, period. This was clearly the intent from the beginning and now it’s proven successful. Happy birthday Your Majesty ! !